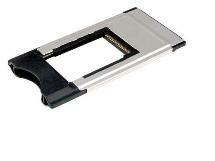 This CardBus-to-ExpressCard Adapter converts PCMCIA PC Card slot into ExpressCard/34 slot. It allows USB-based ExpressCard/34 cards such as wireless broadband modem 3G & 3.5G Aircard (EV-DO or HSDPA), TV tuner card, I/O port adapter (serial, USB), flash memory card adapter, ExpressCard SSD (expSSD), GPS receiver, etc., to be used in PCMCIA CardBus PC Card slot of digital devices including notebook or desktop computer, PCMCIA card reader, etc. Users can insert this PCMCIA-to-ExpressCard adapter into a PCMCIA PC Card slot of digital electronic device such as desktop or laptop computer, card reader, and others; to operate USB-based ExpreeCard/34 cards. 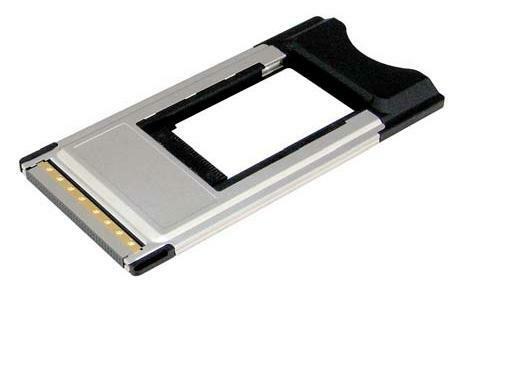 This PCMCIA CardBus to ExpressCard adapter requires no drivers on any host system that fully supports PCMCIA PC Card specification. This adapter works with Microsoft Windows 2000 SP4 / Server 2003/ XP & XP 64-bit / Vista & Vista 64-bit/ 7 & 7 64-bit and Mac OS X v10.3 & later. Please click here for other card adapters.